A peach colored hot air balloon attached to a red trolley car full of people, set to rise over the Pacific coastline. Illustration fills the button, sky to land; red text on top circles around the balloon in the sky, black text on bottom wraps around the ground. 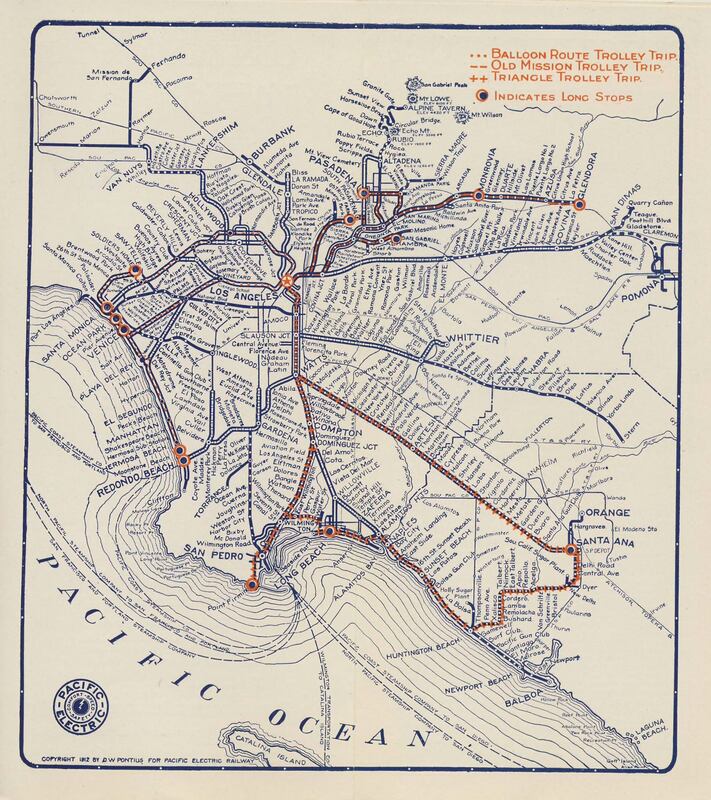 The Balloon Route Trolley Trip was one of several sightseeing excursions that ran daily from Los Angeles on Pacific Electric Railway tracks in the early 1900s. (map of routes) The original tour route resembled a balloon-shape, hence the name. The Excursion Manager, Charles Merritt (C.M.) Pierce, took visitors from Los Angeles to the ocean, then north 28 miles along the coast, visiting ten beaches and eight cities. The Balloon Route included visits to Hollywood and Beverly Hills, National Soldier’s Home, Playa del Rey, Redondo Beach, Moonstone Beach, Venice of America, and free admission to The Camera Obscura at Santa Monica. Each day long guided trip was sold for one dollar per person. "The Best $1.00 Trip in the World"